I’ve now completed the first main section of the course, entitled Writing about Photography (though it does also include a section called Reading About Photography). As I’ve indicated elsewhere in these notes, I already do a fair amount of both reading and writing about photography & photographers. For that reason, the study in this section has been more about providing some structure and embellishment to what I’m already doing rather than sending me off in a new direction. The notes ask that we reflect on how our studying in this section might impact on our photographic practice. I do feel that it has helped to hone the skills. It’s always useful to go through a structured process such as this, and I also enjoyed reading the ‘Criticizing Photographs: An Introduction to Understanding Images’ book by Terry Barrett, published by McGraw Hill. This is the Fifth Edition of this American book (which says something in itself) and was published earlier this year. I have read it through once and referred back to one or two sections again; and I think that it is a helpful read in relation to all aspects of the background study for the OCA Photography courses. To read a structured study of how those criticising photographs approach what they do is definitely helpful when subsequently reading those critique – as well as helping us to structure our own. Writing about one’s photography, in the broadest sense, is part of the development of a practice in many practical ways. Whether writing captions, artists statements, proposals, or whatever, the skills of communicating ideas and concepts clearly, understanding the reader so as to write for one’s audience, appreciating how one’s work relates to others, all are important. I’ve also benefited from some very simple practical tips, too. Summarising each paragraph of a complex article in a single sentence, for example; it is obvious, but it isn’t something I’ve tended to do with academic writing in the past, but it worked well in pulling together the argument in the Berger essay – I shall use it again. Speaking of the Berger essay, ‘Understanding a Photograph’, I think I got quite a lot out of that exercise, but partly because it linked into something else I’d read recently. It makes me reflect on the joys and frustrations of reading about photography. The ‘story’ went something like this – I read the Berger article & did the various exercises; it led me to go back to an article I’d read in Hotshoe magazine, A. D. Coleman’s ‘Letter from New York’ column, which in the March/April edition was entitled ‘John Berger goes to the dogs’; reading Cloeman’s comments about Berger’s writing and comparing them to my own led me to reflect on differences of approach – those like Berger, and perhaps Sontag & Barthes, with what I might refer to as philosophical discourse, on the one hand, and Fried, Coleman etc, with a more analytical approach; unsure whether my thinking was valid, I remembered some reference to the prevalence if literary-based writers (Barthes being one of those referred to) on photography theory over the more practice-based; that came, I think, from a book entitled ‘Photography Theory’, edited by James Elkins, and off I go to try and find the reference; etc etc. At one level, it’s a delight to recognise that there is so much to read and learn. At another, there is never enough time to follow everything through. Patience is the answer, I guess, keep reading, keep reflecting, wait patiently for the occasional penny to drop! I have already completed the exercises in volving writing about some of my own images and this exercise asks me to research & analyse one image – my choice from four provided in the course notes. I’m going to go with this one. 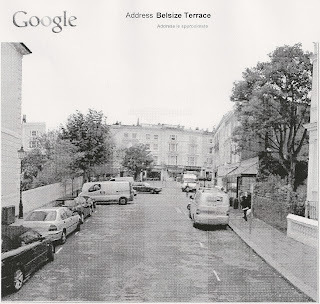 Even without its helpful and specific title, one could make a fair shot at identifying time and place for this image. The two vehicles and the little girl’s mackintosh would probably place it in the middle part of the 20th century; and the housing would suggest UK, with London as a good bet. Actually, though, a little bit of Internet research leads me to put a question mark against the exact location. I came across a print of this image, on sale through Christies here, going under the title London (Belsize Crescent) 1951-52. Looking at a current Google Streetview image of Belsize Crescent, one might question the accuracy of that title and wonder whether Belsize Terrace looks a better match. Not that it matters, of course, other than as a small illustration of how an image develops a life of its own and easily loses contact with notions of truth and reality. It doesn’t take too much further digging around to discover that there is, probably, a story around the creation of the image. It is in a sequence of at least three photographs taken by Frank at this location in the winter of 1951-52. There are diptych prints around of two images, one a front view of the hearse and the other a different version of the girl running, in which she is closer to the hearse – see below. So, we might imagine Frank, walking the streets of London on that damp foggy winter’s day, during his visit to London, from Paris, in late 1951to early 1952, documenting the contrasts of the city – bankers in bowlers on the one hand and workers on the other - collecting images, some of which would eventually form part of his ‘Black White & Things’ book produced in 1952, and which would later form part of the ‘London & Wales’ book or the ‘Storylines’ exhibition more than fifty years later. He sees potential in the hearse, empty, open, absurdly waiting unattended for who or what; and then the little girl appears, running down the pavement – from the rain, from Frank, from the hearse, who knows – but he has time to take (at least) two images of her from the back before she runs round the corner that seems to lie to her left in the original image from the course notes. That may or may not be the ‘truth’; and the image now has the kind of iconic status that puts its reading and interpretation into the public domain of multiple readings where the ‘reality’ of what actually took place ceases to have meaning or relevance. So, how do I read it? The dark shape of the hearse’s body dominates the frame, contrasting sharply with the almost white, almost washed out sky, into which the background buildings seem to fade completely. The diagonal lines, formed by the converging perspective of street, terrace, pavement and vehicle, all lead, more or less, to the figure of the little girl, as she runs, silhouetted against the wet pavement that is rendered almost white as it reflects the sky and mist. 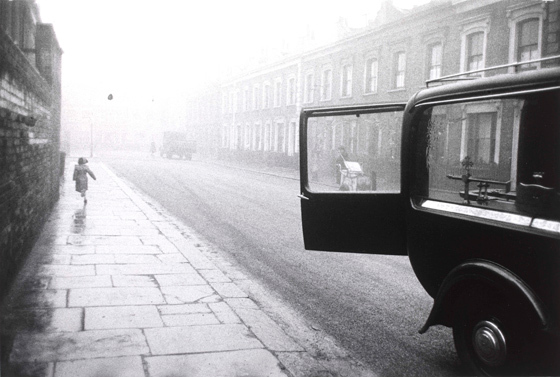 The open rear door of the hearse frames a street cleaner, who stands beside his hand-cart, apparently watching from the other side of the street. A lorry is just visible, parked further down the street, and there could be another figure, standing by it or crossing the road. It is a dull, damp, wet scene – funereal, one might say. Whatever time of day, there can have been very little light and Frank must have been using a sensitive film to have captured the girl in motion as he has – hence the grainy nature of the print, which adds to the sombre feel of the image. It is the juxtapositions that pose questions, prompt thoughts and reflections, and ultimately, I suggest, lead to the longevity if the image. Although it was created and has been presented alongside images that contrast different strata of British society in the early fifties, this particular image is class-less. Its ‘signs’ are about life in general – unlike, say, the comparisons between Frank’s images of London bankers and Welsh miners, all taken around the same time. In this photograph, Frank has created a surreal scene out of the absurd accidents and incidents of ordinary life. Death, represented by the hearse and the ‘grim reaper’ character across the road, awaits all of us – even this little girl who runs innocently away from our view. It’s hard not to read the image in this way. Some years later, Jack Kerouac, in his introduction to Frank’s groundbreaking book ‘The Americans’, said that Frank “... sucked a sad poem right out of America onto film ...”. 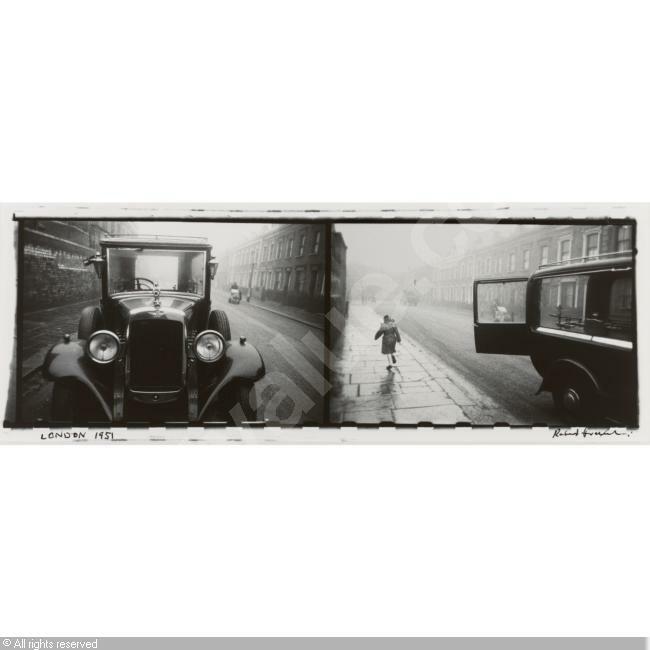 That book, and the ‘road trips’ that led to its influential sequence of images, was still some years away when the photographer, just 27 in 1951 and recently a father, took this little series of shots on a London street. But this particular composition seems to fulfil that poetic notion – innocent and insignificant, apparently, yet provocative and unsettling. I would suggest that it is a photograph ‘of its time’ in more ways than one. Its power and its poetry stem, partly, from the association with and connotation of ‘truth’ that a grainy, black and white print possesses. 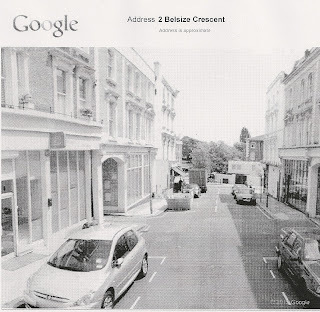 In the introduction to Frank’s book ‘London/Wales’, in which this image appears more than fifty years after it was taken, he is quoted as saying ‘... London was black, white and grey ...”. The scene must, of course, have existed on colour, albeit muted in this light, but we read the ‘truth’ as this black and white. In an interview with Sean O’Hagan in the Observer in 2004, Frank says “The kind of photography I did is gone.” And “There are too many pictures now.” It is difficult to imagine a colour photograph of a similar scene in a London street today having the same poetic power. And to recreate the scene, in grainy black and white would not be the ‘truth’, perhaps? The photographic image’s slippery relationship with truth and reality is well illustrated here, as its ability to rival poetry in addressing some of the essences of human life, or death. I could, maybe should, have done more ‘book’ research in putting together this analysis. I’ve done quite a bit on the Internet, but finding evidence of ‘learned’ pieces on the subject hasn’t been easy. I do have Frank’s ‘The Americans’, and can also pick up references to him and his work in other general photographic publications. I know that this images appeared in ‘London/Wales’ and in the ‘Storylines’ exhibition at about the same time (c2003-4), but I’m still not sure where, if anywhere, it was published closer to the time it was made. In the past, I have often gone out and bought the books I wanted to consult, and might have done so had this been an assignment, but I think I need to try and find access to a sizeable library to support my future studies.